Registering for Payonee account and getting to use its MasterCard in Nigeria is quite simple and easy. Like some may say, how possible is that? That can be made possible by using some of your credentials in registering for it, and such credential s include, Nigerian Voter's card, National I.D card or Driving License. Any of the above can be used in essence just to serve as a valid method of identification for your payonee's approval, after registration. But in a situation where by you don't have any of the above mentioned to use for payonee's identification, then know it that the payonee's Mastercard would get to you by means of shipping it free of charge to Nigeria. But it will have payonee's Logo written on it bodly. Since none of the credentials was provided by you for valid identification verification. The Master card will arrive within 22 to 29+ days. May be seeing this post is your first time of encountering payonee and it looks strange because you don't know what its all about. Now, payonee is a company concerned about an online payment just like PayPal online account and payza. Although is a US account but it gives access to most countries to use without being in US. Today we are talking about how Nigerians will make good use out of it with ease. So with payonee one is entitled to get a free US online account with a routing number that serves for receiving payment which was rendered online by any one. Also for receiving/sending on making payments for another payonee account user. The payonee ATM ( Asynchronous Transfer Machine) card can be used to purchase anything in online stores as long as the store in talk accepts prepaid cards and provided you have money in your payonee's account. Also once there is money on your payonee's account, you can withdraw it with Payonee's MasterCard from any ATM around the world. 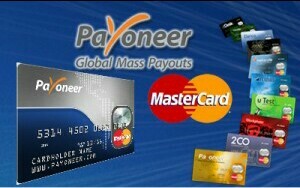 How Can I Create And Own My Own payonee Account with Free MasterCard? ==>1. That's very easy to do, just visit www.payoneer.com and then click on sign up to fill in your details. ==>2. To fill in the form with your details, like your real name and address, just make sure the details appears correctly exactly the ones on your I.D (Voters card, Drivers license or National I.D) You will be required to put your Zip code. So if you dont know the zip code of your area, To get it, search your resident zipcode on Google search. ==>3. In the section of putting your password, put a strong password you can remember easily whenever you want to login, don't make it simple and don't make it to hard for you to remember. Also in that section, choose a secret Question and Answer which will be used in recovery whenever you wish to chat or contact payoneer officials for anything. Reason for that is because, the question you choosed when registering for the account will be used to ascertain if one is using your account or not. Also used to get new password if eventually you lost the old password. ==>4. Choose your I.D type, if what you have is drivers license, select it and provide the details required. And for other I.D like voters card, National I.D etc choose OTHERS and fill your details as well. ==>5. Next, you will be required to enter alternative shipping address, if its different from the previous you entered. Make sure you don't make a mistake when entering that and also let it be a valid address because, that will be the address in which your payoneer Debit Card will be shipped to in Nigeria. Same is applicable to other countries. ==>6. Now, review all that you have entered and check if you altered any information, if there is non then click on ORDER Button and that's it. You are Almost there. Your account should be under review for approval by payoneer. So it will only take a minimum of two to three days for it to get approved, minding that your I.D details provided are valid. With everything being intact, your approval is sure, just keep checking your mail box for their approval message. Let's assume you are approved after all above, now your Payoneer MasterCard will be shipped to the address you provided in the section of alternate address within the period of 22 to 29 days. So get ready in 3 to 5 weeks max for your MasterCard to be delivered to you. Have you waited for 5 to 6weeks and nothing showed up to the address you gave during application, just get your I.D and goto the nearest post office around the place of address you gave during application and enquire for the MasterCard. But you can choose not to border your self by going for fast delivery (3 to 6 days) but you will have to pay $50 for the shipping through the option of DHL. Once your payoneer Card has reached you, the very last step will now come to be in place. So Bravo you are now with your Payoneer card, next is to activate it by login into your Payoneer Account through this address given myaccount.payoneer.com When you login click on the option which is ACTIVATE, enter any four digit of your choice as your password for the Card. Note the four digits is the password you will always use when withdrawing from the account. All the steps are now completed. Go ahead and enjoy your online account from payoneer. Note, with the payoneer card, you can withdraw from any Bank ATM of your choice any where, banks like Diamond, Eco-Bank, zennith, First Bank, Fidelity, UBA bank etc. Make sure you keep your card save because, if it should get to the wrong hands, it is possible for that person to make a purchase for online goods without using the pin. So safeguard it in all cost to avoid had I know. Don't forget to share to your friends with below share buttons if you found the post more eye catching and interesting. 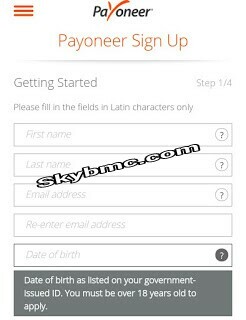 √How To Send Or Receive Money From One Payoneer Account To Another. √Reason Why Your Payoneer MasterCard Has Not Been Delivered And Solution To That.